They say it’s good luck for it to rain on your wedding day. For Thuy and Eugene’s sake, I hope that’s true! Their Hudson Gardens wedding on the Fourth of July had to be moved indoors at the last minute due to some menacing storm clouds, but luckily the venue was quick to accommodate. I also added something new to my mental checklist before each wedding. Make sure the groom has pants! Apparently Eugene had left them on the ironing board at home, so had to send a groomsman to retrieve them. Even though their plans kept changing, they both remained upbeat. The rain wasn’t going to dampen their spirits! The guests clearly didn’t mind, as most of them were instantly in tears. It just goes to show, don’t stress so much about the details! Realistically, something will probably go wrong. Maybe it’s the weather. Maybe it’s pants 🙂 But in the end, everyone is there to share your love and enjoy the day. The rest is just icing on the proverbial cake. I have to admit: usually the jumping shots make me cringe. I’m always afraid someone’s going to twist an ankle. Or have a… wardrobe malfunction. But this bridal party made it work! I love that Thuy tucked her legs all the way up and it looks like she’s floating. Luckily, the clouds began to clear after the ceremony and we were still able to get a few shots around the beautiful Hudson Gardens. After a hilarious entrance and the first dance, it was time for everyone to enjoy some well-deserved dinner. Everyone may have been a bit damp, but there’s nothing cake can’t fix! 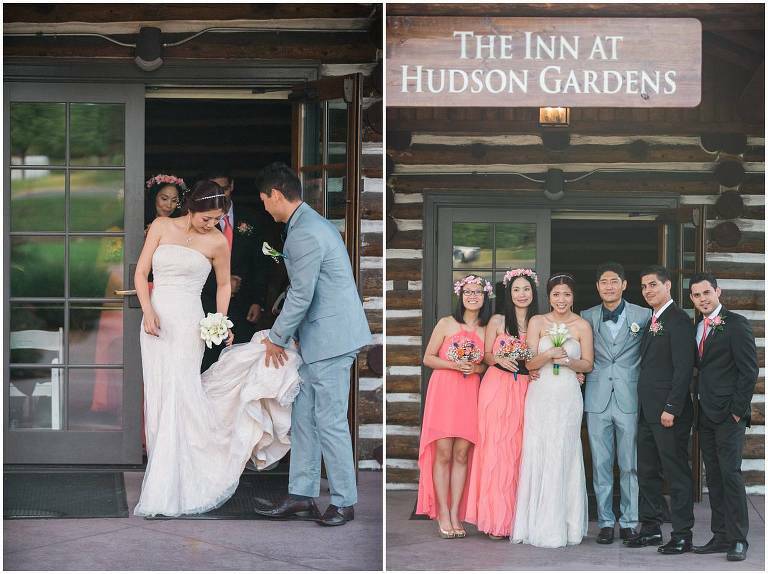 Planning your own Fourth of July or Hudson Gardens wedding? Let’s get in touch!